Here they are, the dates for this fall/winter’s board dates. If you are applying for a four year high school Army ROTC scholarship that will start in the fall of 2019, that would be a high school senior in the fall of 2018, graduating in the spring of 2019, these are the dates you should pay attention to. Same advice as last year…You should complete your application before the board that makes you the most competitive. I would recommend you try to get in on one of the first two boards. Waiting till the deadline and being seen by just one board is rarely the best course of action. If you have a strong file you should be shooting to have your file complete by 1 October and reviewed by the first board. Look at SAT/ACT dates. If you don’t do so well the first time you can take those tests again. Your second shot is usually some time shortly after the October board, so you should be shooting for the second board and submitting improved scores if your file isn’t strong. Here’s where you can get some free help with those tests, use it. If you wait until the second or third board your chances are diminished because there will obviously be less allocations available after each board but don’t rush to be on the first board if you aren’t ready. I would tell you that you shouldn’t wait to be able to do one or two more push ups on the PFT, but if your SAT/ACT is low retake and wait for the next board. 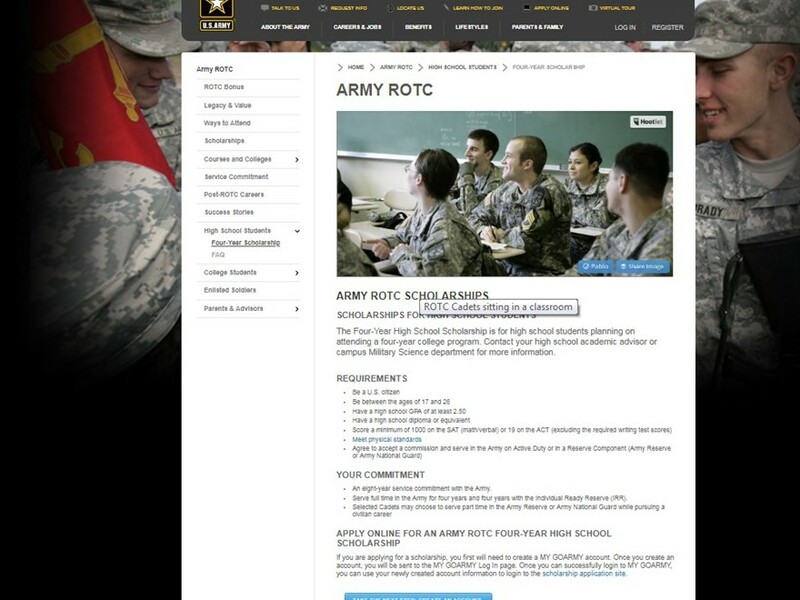 As you go through the process make sure you read about all the components (this blog is a good source of information, if I do say so myself) and stay in touch with at least one of the recruiting officers at one of the schools on your list. Notice I said recruiting Officer, and not recruiter…there is still a difference. Good website-most informative results from search engine. Question: When are the scholarship awards announced, and how does the Board get the word out? The Board usually takes about a week, and once the board does it’s work it usually takes Cadet Command another couple weeks to determine who will get offers. Remember that the scores from the boarded files place the applicant on a standing order of merit list that includes previous boarded applicants that haven’t gotten an offer yet. If an Applicant gets an offer their status on the application will change, I believe an email is sent, and they will probably hear from a couple of the schools on their application list. I usually contact my winners via email in a day or two of results being released. I also touch base with my applicants that got Offers to other schools to make sure they understand their options, if Clarkson is their school of choice. My son has completed the application process, but not the PMS interview. Does the packet sill move forward or does go on hold until the interview process in complete? For the file to be boarded, the PMS interview is required. If your son does not get that interview done in time for the second board his file will be scored by the third board and he will be eligible for offers made in the third round. My application changed board ready on 11 Jan. I am wondering it will be scored by the second board or third board. Probably second board. You can contact a ROO from one of the schools on your list to confirm. i received an ECP scholarship on the first board that i decided to decline. I have not heard anything yet for the 2nd board so i was wondering what my chances are of getting in on the 3rd? Luke…sorry for the late delay. You have a chance, but usually the ECP first round offers indicate you are close to the historic cut line for scholarship offers. You should definitely go back into your application and make sure everything looks right and you didn’t leave out any activities or sports. good luck on the last round and remember you can still become an Army Officer without winning a national scholarship. If you don’t get an offer come to school this fall ready to compete for a campus based scholarship. My daughter was not chosen on the first two rounds. She is listed as waiting for the March decisions. Do they release the OML to the public so they understand where they are on the scored list? Currently she is in the reserves at AIT. They do not release the OML…nor do they release the results of the survey they took on the application website (the CBEF). In my mind there is no value in knowing where you ranked, since there is nothing you can do about that once the third round of offers is made. All you can do at that point is show up on campus and try to compete for a campus based scholarship. Your daughter is currently in AIT…shouldn’t she be in high school?